Get more information about known risks, statistics and tips for driving while pregnant in our blog articles. Attico NB, Smith RJ 3rd, FitzPatrick MB, Keneally M., “Automobile Safety Restraints for Pregnant Women and Children.” The Journal of Reproductive Medicine. March 31, 1986 (3):p187-92. Cesario RNC, PhD, Sandra K., “Seat Belt Use in Pregnancy: History, Misconceptions and the Need for Education.” Nursing for Women’s Health. Volume 11, Issue 5 (October|November 2007): p474–481. Delotte, J.; Behr, M; Thollon, L; Arnoux, P; Baque, P; Bongain, A; Brunet, C; “Pregnant Woman and Road Safety: a Numerical Approach. Application to a Restrained Third Trimester Pregnant Woman in Frontal Impact.” Journal de Gynecologie Obstetrique et Biologie de la Reproduction (Paris). Volume 36, Issue 6 (October 2007): p577-81. Delotte, J.; Behr, M; Thollon, L; Arnoux, P; Baque, P; Bongain, A; Brunet, C; “Pregnant Woman and Road Safety: Experimental Crash Test with Post Mortem Human Subject.” Surgical and Radiologic Anatomy. Volume 30, Issue 3 (May 2008): p185-189. 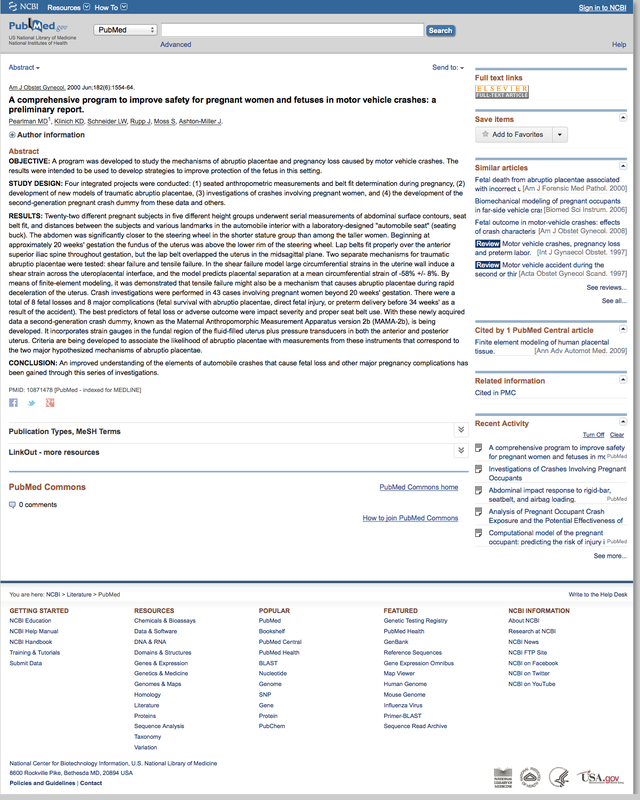 Duma, Stefan; Moorcroft, David M.; Stitzel, Joel D.; Duma, Greg G.; “Computational Model of the Pregnant Occupant: Predicting the Risk of Injury in Automobile Crashes.” American Journal of Obstetrics and Gynecology. Volume 189, Issue 2 (August 2003); p540-544. Duma, Stefan; Moorcroft, David M.; Stitzel, Joel D.; Duma, Greg G.; “Evaluating Pregnant Occupant Restraints: The Effect of Local Uterine Compression on the Risk of Fetal Injury.” Association for the Advancement of Automotive Medicine. Volume 48 (September 2004). Duma, Stefan; Moorcroft, David M.; Gabler, Hampton C.; Manoogian, Sarah M.; Stitzel, Joel D.; Duma, Greg G.; “Analysis of Pregnant Occupant Crash Exposure and the Potential Effectiveness of Four-Point Seatbelts in Far Side Crashes.” Association for the Advancement of Automotive Medicine. Volume 50 (September 2006): p187-198. Duma, Stefan; Moorcroft, David; Stitzel, Joel; Duma, Greg; “A Computational Model of the Pregnant Occupant: Effects of Restraint Usage and Occupant Position on Fetal Injury Risk.” Virginia Tech – Wake Forest, Center for Injury Biomechanics – United States Paper Number 05-0367 (2005). Hardy, WN; Schneider, LW; Rouhana, SW; “Abdominal Impact Response to Rigid-Bar, Seatbelt and Airbag Loading.” Stapp Car Crash Journal. Volume 45 (November 2001): p1-32. Hyde, Lisa K.; Cook, Lawrence J. MStat; Olson, Lenora M. MA; Weiss, Harold B. MPH, PhD; Dean, J. Michael MD, MBA; “Effect of Motor Vehicle Crashes on Adverse Fetal Outcomes.” Obstetrics & Gynecology. Volume 102, Issue 2 (August 2003): p279-286. Klinich, Kathleen DeSantis; Schneider, Lawrence W.; Moore, Jamie L.; Pearlman, M.D. ; “Injuries to Pregnant Occupants in Automotive Crashes.” University of Michigan – United States Paper Number 98-SP-P-17 (1998). Klinich, Kathleen DeSantis; Schneider, Lawrence W.; Moore, Jamie L.; “Investigations of Crashes Involving Pregnant Occupants.” Association for the Advancement of Automotive Medicine. Volume 44 (2000): p37-56. Klinich PhD, Kathleen DeSantis; Flannagan PhD, Carol A. C.; Rupp PhD, Jonathan D.; Sochor MD, Mark; Schneider PhD, Lawrence W.; Pearlman MD, Mark D.; “Fetal Outcome in Motor-Vehicle Crashes: Effects of Crash Characteristics and Maternal Restraint.” American Journal of Obstetrics & Gynecology. Volume 198, Issue 4 (April 2008): p450.e1–450.e9. Pearlman, M.D., “Motor Vehicle Crashes, Pregnancy Loss and Preterm Labor.” International Journal of Gynecology and Obstetrics.Volume 57, Issue 2 (May 1997): p127–132. Pearlman, MD; Klinich, KD; Schneider, LW; Rupp, J, Moss, S; Ashton-Miller, J; “A Comprehensive Program to Improve Safety for Pregnant Women and Fetuses in Motor Vehicle Crashes: a Preliminary Report.” American Journal of Obstetrics and Gynecology. Volume 182, Issue 6 (June 2000): p1554-1564. Weiss, HB, “The Epidemiology of Traumatic Injury-Related Fetal Mortality in Pennsylvania, 1995-1997: the Role of Motor Vehicle Crashes.” Accident Analysis and Prevention. Volume 33, Issue 4 (July 2001): p449-54. Weiss, HB; Songer, Thomas J.; Fabio, Anthony; “Fetal Deaths Related to Maternal Injury.” The Journal of American Medical Association. Volume 286, Issue 15 (October 2001): p1863-1868. Weiss, HB; Strotmeyer, S.; “Characteristics of Pregnant Women in Motor Vehicle Crashes.” Injury Prevention:Journal of the International Society for Child and Adolescent Injury Prevention. Volume 8, Issue 3 (September 2002): p207-10. Weiss, HB; Sirin, Hulya; Sauber-Schatz, Erin K.; Dunning, Kari; “Seat Belt use, Counseling and Motor-Vehicle Injury During Pregnancy: Results from a Multi-State Population-Based Survey.” Maternal and Child Health Journal. Volume 11 (2007): p505-510. Weiss, HB; Vladutui, Catherine J.; “Motor Vehicle Safety During Pregnancy.” American Journal of Lifestyle Medicine volume 6, issue 3 (May/June 2012): p241-249. Redelmeier DA, May SC, Thiruchelvam D, Barrett JF. “Pregnancy and the risk of a traffic crash.” Canadian Medical Association Journal volume 186 (10), (May 2014): p742–50. Evans L, Redelmeier DA. “Traffic Deaths Before and After Birth.” European Journal of Obstetrics & Gynecology and Reproductive Biology volume 194, (November 2015): p258-259. NPR – (5/12/14) While this article doesn’t mention the Tummy Shield, it does describe a Canadian study that shows women in the 2nd trimester are more likely to be involved in a motor vehicle crash. Tummy Shield can help protect mom and baby in the increased likelihood of a crash. USA Today – (11/27/09) Researchers trying to protect pregnant drivers. Researchers and car manufacturers realize seat belts aren’t the optimal answer to safety for pregnant women and although it’s the best safety device they have, they could make it better.